I Wonder is a picture book for children ages 1 and up. The story is about a little girl who takes a walk with her mother and encounters a range of mysteries—from gravity, to life cycles, to the vastness of the universe. 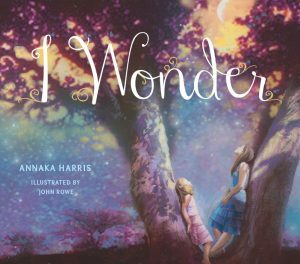 She learns to talk about how it feels to not know something, and she learns that it’s okay to say “I don’t know.” In the process, she discovers that there are some things even adults don’t know—mysteries for everyone in the world to wonder about together! John Rowe creates original art and oil paintings for both illustration and fine art clients. His illustration clients include the United Nations, Disney, Random House, Simon and Schuster, and Buena Vista Pictures. His projects have encompassed movie posters, book covers, advertisements, murals and fine art paintings for clients and collectors.